Historically, methods to prevent inherited diseases have been limited to selective breeding practices. However, an inability to identify asymptomatic carriers of recessively inherited diseases or dogs in the preclinical phase of late-onset inherited diseases, have traditionally made great reductions in disease incidence difficult to obtain through selective breeding alone. Genetic testing is now playing an important role in identifying these dogs such that breeders can make more informed decisions when it comes to mate selection; thereby, preventing suffering from diseases which were once considered a nearly unavoidable evil despite breeders’ best efforts. Here we discuss three relatively common examples of preventable congenital or early-onset inherited diseases that veterinarians may see in their young canine patients. Since some breeders have been slower to adopt genetic testing of breeding dogs than others, requesting that the owners of an affected dog discuss their test results with their dog’s breeder can make a profound difference in the overall health of that bloodline and future litters of puppies by introducing the breeder to these helpful technologies. 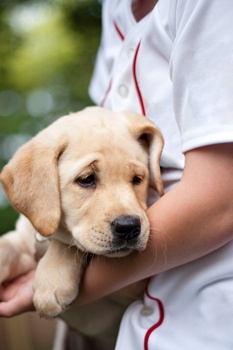 A relatively common condition of the Labrador retriever and other breeds, exercise-induced collapse (EIC) is an inherited neuromuscular disease that may be easy to confuse with other diseases when based upon the client’s description of collapse. Dogs with EIC typically present at a young age with episodes of collapse associated with strenuous exercise. Dogs will often begin showing hind limb ataxia after 5 to 20 minutes of exercise which progresses to the front legs. Affected dogs may drag their hind limbs for a short time before fully collapsing and may have absent patellar reflexes. Dogs tend to remain conscious during collapse. In some dogs, the anticipation of exercise or an impending hunt is enough to induce collapse. After a short recovery time, typically lasting from 15 to 30 minutes, affected dogs are able to get back on their feet and will appear completely normal between episodes. Sadly, there have been rare reports of dogs dying during episodes of collapse or drowning due to episodes which occur during swimming (though swimming appears to induce collapse less frequently than running on dry land). Though warm ambient temperatures are not necessary for collapse to occur, it is believed that dogs may be at greater risk of collapse when the ambient temperature is high. EIC is caused by a genetic mutation of the canine DNM1 gene and is inherited in an autosomal recessive fashion meaning that dogs must inherit two copies of the mutation (one from each parent) in order to develop disease. EIC also displays a phenomenon known as incomplete penetrance in some dogs. This means that not every dog with two copies of the mutation (“at-risk” dogs) will actually develop episodes of collapse. However, the overall percentage of at-risk dogs which go on to develop collapse is not known and predicting which dogs will develop clinical signs is not currently possible. As with all recessive diseases, dogs which inherit just a single copy of the mutation will not develop signs of the disease, but are considered “carriers” of EIC. Dogs carrying a single copy of the mutation should only be bred to dogs that have not inherited the mutation in order to avoid producing affected dogs. Unfortunately, other than avoiding strenuous activity or stress triggers, there are no particularly effective treatments currently available for EIC. However, use of anticonvulsants and supplements have been discussed and appear promising in some cases. Affected dogs showing early signs of ataxia with exercise should be encouraged to rest immediately. Some of the most common questions we answer at Paw Print Genetics are those about the availability of testing for epilepsy in dogs. Unfortunately, genetic mutations associated with epilepsy have remained elusive for many breeds, but a mutation of the canine DIRAS1 gene identified in Rhodesian ridgebacks has made prevention possible for one particular type of epilepsy known as juvenile myoclonic epilepsy (JME). Dogs affected with JME typically present between 6 weeks and 18 months of age with frequent, uncontrolled myoclonic jerks of the limbs, head, eyelids, or jaw resembling electric shocks or a startle response. Movements can be of variable severity from nearly imperceptible movements to severe, dramatic events where dogs may jump or run for short distances placing them at risk of injury. Myoclonic jerks are most common during rest or in the beginning stages of sleep and some dogs may experience an increase in episodes after vaccination or during high ambient temperatures. Various visual stimuli including flashing lights and sudden changes in light intensity have also been implicated as a cause of increased episode frequency. Like EIC, dogs with JME appear normal between episodes, but may appear disoriented or agitated immediately after an episode. Some dogs may go on to develop generalized seizure activity as they age. JME is also inherited in an autosomal recessive fashion and breeding recommendations for JME would be similar to EIC in terms of only breeding heterozygous carriers to dogs which have not inherited the mutation in order to prevent the birth of affected puppies. It should be noted that dogs testing negative for this particular mutation could still be at risk of a different type of epilepsy caused by different genetic or environmental factors. Since treatments for JME are typically limited to anticonvulsant drugs (some with significant side effects), prevention of seizure activity in puppies through informed mate selection would be far preferable when possible. Intestinal cobalamin malabsorption (aka Imerslund-Grӓsbeck syndrome or IGS), caused by a mutation in the canine CUBN gene, is an inherited cause of vitamin B-12 (cobalamin) deficiency known to occur in the border collie and a non-standardized, Australian working breed known as the koolie. Dogs affected with IGS suffer from dysfunction of a receptor known as Cubam which plays an important role in absorption of cobalamin from the intestinal tract as well as a variety of low-molecular-weight proteins from the kidneys. Dogs with IGS present as early as 8 months old with progressive, non-specific clinical signs including anorexia, lethargy, poor weight gain, and poor muscle mass. Dogs may also develop non-regenerative anemia, hyperammonemia, hyperhomocysteinemia, metabolic acidosis, neutropenia, bradyarrhythmia, and mild proteinuria during the course of disease. Dogs frequently develop neurological dysfunction as the disease progresses and dogs are at risk of irreversible brain damage if treatment with cobalamin is not initiated in early stages of disease. Affected dogs as young as 14 weeks of age also display profound methylmalonic aciduria, a relatively consistent and sensitive clinical sign of cobalamin deficiency. If diagnosed at a young age, dogs with IGS can be treated with regular supplementation of cobalamin to avoid sequelae of prolonged cobalamin deficiency. Therapy for IGS in the young dog results in a complete remission of hematopoietic and metabolic clinical signs though they will continue to display mild proteinuria throughout life. In some cases, dogs do not develop obvious clinical signs of cobalamin deficiency until they are 2 to 3 years of age. IGS is inherited in an autosomal recessive fashion and breeding recommendations for dogs with the causal mutation parallel those of EIC and JME. Genetic testing continues to play an increasing role in assisting breeders around the world to eliminate over 200 inherited diseases from their kennels. The increase in genetic testing is largely due to the rapid rate at which new mutations are being discovered and the fact that some of these mutations are being identified in breeds for which disease-causing mutations had previously been undiscovered. Not only does this mean that more dogs are being born free of diseases that were once causes of suffering, but more dog owners are also coming to their veterinarians with questions about inherited conditions and genetic testing than ever before. Veterinarians with even a cursory knowledge of the genetic health testing available for dogs or where to look for them can play a useful role in future disease prevention by recognizing a disease as inherited and by encouraging their clients to notify the dog breeder when diagnosed. Even when treatment options are few, requesting that a breeder is notified about the disease can easily prevent tens to hundreds of puppies from facing unnecessary suffering. If you have questions about a particular case or would like to explore how genetic testing can improve your quality of medicine, please feel free to contact the Paw Print Genetics laboratory to speak with our fantastic staff of geneticists and veterinarians at Askus@pawprintgenetics.com or 509-483-5950 (Monday through Friday; 8 am to 5 pm Pacific time).